It is the beginning of June. I sit on my balcony in shorts and soak up the sun. Hockey season has just ended. Here in Montréal, anyways. For the rest of Canada, the excitement of cheering their local NHL teams was over by mid-April, when the trees were still bare. The Montreal Canadiens, however, as the only team from north of the border, made it into this season's play-offs. And once the séries start, the city's fever pitch rises as inevitably as the temperatures outside. Montréalais are fanatic about their team, la sainte flanelle, on an ordinary day. If the team reaches the play-offs, the crowd's enthusiasm takes on near-fanatical dimensions. The Habs did everything to keep the excitement up. In the best-of-seven pairings, they quickly dispatched their first round opponent Tampa Bay (where home games are mostly attended by vacationing Canadian snow birds) 4-0, so as to advance to the greatest thing next to winning the actual cup: A play-off encounter with the Boston Bruins, Montréal's traditional arch rival from the original six. It was then, at the very latest, that Habs-Mania took over. Lebanese grocery stores and French high street fashion boutiques started flying the famous tricolore. Bell and Vidéotron, two cable companies, fought out a highly entertaining ad battle over whose corporate colors looked more like the Canadiens'. Air Canada started offering game day fare sales on the Montréal-Boston route, extended every time it became clear that yet another game was required. Even my boss, a laid-back Australian not previously known as a hockey affictionado, started growing his "play-off beard". Much to the chagrin of his wife, he was not going to shave it off quickly, for the Habs fought tooth and nail, err, fist and stick, to wrest a seventh game victory from the favored (and very physical) Bruins. The decisive game attracted a sell-out crowd of 17'500 people to the Boston Garden. 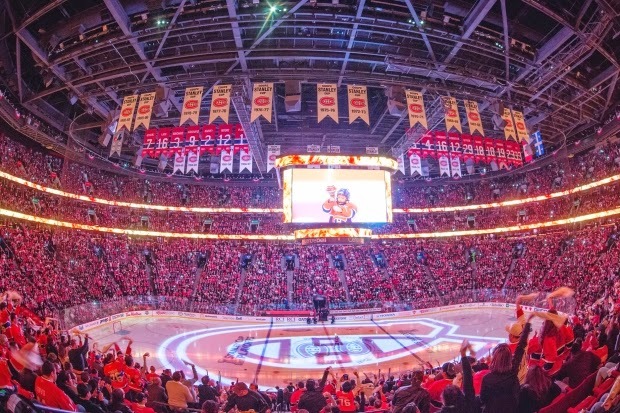 And another sell-out crowd of 21'000 people to the Bell Center in Montréal, where the fans paid to watch their heroes on giant screens while sipping $12 beers from the team's owner. Street corsos reminiscent of Rome after a soccer win by the squadra azzurra ensued after Boston was sent off to the golf course, and the next day the media started invoking that magical expression "ça sent la coupe" , realizing that now, only the New York Rangers stood between the Canadiens and their first Stanley Cup finals since 1993. Alas, it was not to be: A first game injury to the Habs' goalie, the foundation on which their play-off run had been built, seemed to break the team's back and made them lose the two vital first home games. Although they managed to win two later games, energy and perseverance were ultimately insufficient. And so, last Thursday, the Rangers finally ended this year's Stanley Cup dreams. Flags were rolled in, jerseys taken off, beards shaved. And the city suddenly noticed that in the meantime, summer had arrived. Some disappointment mixed with relief and justified pride. Or, as a devoted fan explained to me: "It was about time this ended. The sun is up so long these days that it was getting hard to see the screen on the terrasse!"